This is not only a perfect game day food, but also a food that I grew up with! My Mom used to make pizza breads often and she always changed them up, which is why I love this recipe. There are so many fillings you can use and they are interchangeable….even the food itself is called different things. I’ve seen it called Stromboli, stuffed bread, and pizza bread…as I’m sure there are other terms for it! 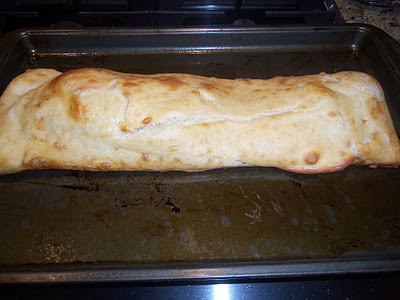 Today I will be blogging about Pepperoni Pizza Bread (which reminds me I have heard it called Pepperoni Bread as well). I don’t really use a specific recipe for amounts, I just wing it on how much stuff I want to fill it with. Sometimes I’m in a cheesy mood so I’ll put more cheese, sometimes if I’m making it for a larger group with men, I’ll put more pepperoni. Some people serve theirs with a side of marinara sauce for dipping, I do not. But feel free to add some on the side if you’d like. You can also use any kind of cheese….mozzarella and provolone are the 2 I’ve used with pepperoni. 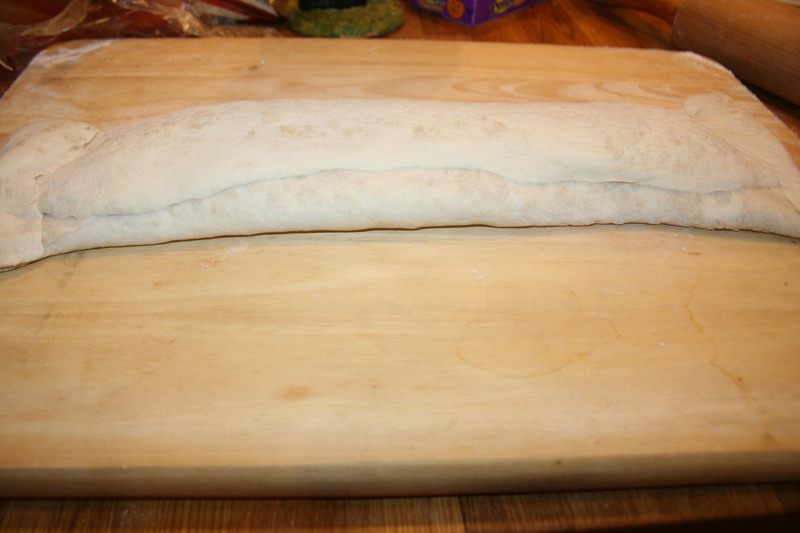 Roll your dough out flat and longer than a round pizza on a WELL floured surface. Length should fit in a baking sheet. Grease the baking sheet with a thin coating of olive oil. 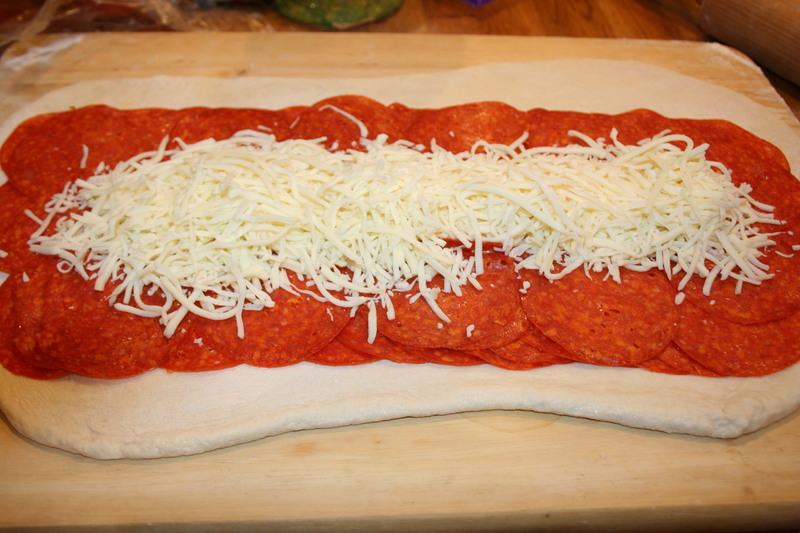 Layer pepperoni, leaving an inch or two the whole way around. Add cheese to the middle of the layer of pepperoni. Gently pull up sides and meet at the middle. Make sure you press down on the fold to nothing seeps out. Gently pull up the ends and press down firmly so nothing seeps out. Lift the entire thing and place it in the center of the baking sheet (I do mine seem side up). If you don’t think you can do this part (it takes some practice) you can place your dough on the baking sheet prior to layering the pepperoni and cheese and then fold it up. Using a pastry brush, brush the entire thing with egg white. Cook for about 25 minutes at 375° or until the top gets golden brown. Let it set and cool for a few minutes, then slice it gently. AND ENJOY! Serve plain or with a side of marinara sauce. I LOVE pizza bread. It’s my favorite that you posted so far!!!!! We love you soooooooo much. And I love you sooooooooooo much!